The Redemptorists » Happy Feast of St. Gerard! 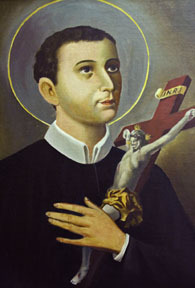 On October 16, Redemptorists around the world celebrate the feast of St. Gerard Majella, a young, 18th century Redemptorist lay brother who is known as the mother’s saint. To celebrate his feast, Sacred Heart of Jesus Parish in Baltimore and St. Clement’s Parish in Saratoga Springs, NY will offer a special blessing after all weekend Masses for expectant mothers and couples hoping to conceive. The Basilica of Our Lady of Perpetual Help in Brooklyn will also have a special celebration for St. Gerard. Good St. Gerard, patron of those longing for children and those expecting them, we ask your blessing upon these women and men, children of God themselves, who yearn for parenthood, for safe delivery, and for the health of all children. Gentle Redemptorist and powerful intercessor, join the prayers of all of us gathered here today. Help us honor the sanctity of life and remember that our bodies are sacred, created in the image and likeness of God. St. Gerard, we are confident that, in your compassion for those who long for parenthood and for safety of their children, you will bring their needs and ours before Jesus our Redeemer. May the God of abundance hear our prayers.